William Hard. Raymond Robins' Own Story. 1920. Contents. Chapter One. WITH Bolshevism triumphant at Budapest and at Munich, and with a Council of Workmen's and Soldiers' Deputies in session at Berlin, Raymond Robins began to narrate to me his personal experiences and his observations of the dealings of the American government with Bolshevism at Petrograd and at Moscow. But he was not merely an observer of those dealings. He was a participant in them. Month after month he acted as the unofficial representative of the American ambassador to Russia in conversations, and negotiations with the government of Lenin. Throughout that period he saw Lenin personally three times (on an average) a week. Incidentally, the degree of eagerness felt by the Allied and American governments to make Lenin's acquaintance and to learn his actual character and his actual purpose, good or bad, may be judged from the fact that during all those months Col. Raymond Robins of the American Red Cross was the only Allied or American officer who ever actually had personal conferences with Lenin. Lenin speaks English fluently. He was talking one day about Russia's industrial backwardness and he made a saying which Robins now calls especially to mind. "The flame of the Socialist revolution may die down here. But we will keep it at its height till it spreads to countries more developed. The most developed country is Germany. When you see a Council of Workmen's and Soldiers' Deputies at Berlin, you will know that the proletarian world revolution is born." We see that Council to-day, and we see Allied and American diplomacy considering it and striving, in one way and another, to deal with it. That is why Colonel Robins is especially moved to speak at this moment. He saw the diplomatic methods which failed to deal successfully with Bolshevism at Petrograd and Moscow, and he feels that he has every reason of practical experience to believe that they will equally fail at Berlin and at Budapest and at Munich and at every other place where they may be tried. The failure at Petrograd and at Moscow was complete. The United States went away from Petrograd and from Moscow diplomatically vanquished. Colonel Robins ventures to state the fundamental reason for our discomfiture. But, before stating that reason, I must, in one respect, state him. He is the most anti-Bolshevik person I have ever known, in way of thought; and I have known him for seventeen years. When he says now that in his judgment the economic system of Bolshevism is morally unsound and industrially unworkable, he says only what I have heard him say in every year of our acquaintance since 1902. He was living then at a settlement in Chicago called the Chicago Commons. It had an open forum called, I think I remember, the Free Floor. On that Free Floor, and in little halls on North Clark Street, and in all sorts of other places, Robins and I heard all sorts of Bolshevik oratory in the Chicago of the early innocent twentieth century. We did not need to wait for the developments of the year 1919 in order to know that Bolshevism, after all, was not invented during the Great War by the German General Staff as a war measure. We heard Bolshevism in Chicago, all of it---the Dictatorship of the Proletariate, the Producers' Republic, the Election of Legislators by Industries, the Abolition of All Classes Except the Working-class---absolutely all of it, in the oratory of sincere and eloquent fanatics almost two decades ago. And it existed long before we heard it. But Raymond Robins' favorite intellectual pursuit was to go after it with all the arguments he could think of. In forums and in halls and at that earnest gathering of local truth-seekers called the Friday Lunch Club he never missed an opportunity to argue against Bolshevism and against every other form of Socialism. I remember that once, when he heard from some false source that I was about to make the hideous mistake of joining the Socialist party, he kept me up till two o'clock in the morning, making me one of his best public orations, all to myself, to dissuade me. He would go to any distance out of his way in order to save any brand from the Socialist burning. To-day, because he opposes American and Allied military intervention in Russia, certain hasty or malevolent persons try to stamp the stigma of Bolshevism on him. I only ask: how many of those persons have ever said one word against Bolshevism where to say it was dangerous? Robins spoke against Bolshevism in Petrograd itself. He labored against Bolshevism., and is publicly recorded to have labored against it, all through the period while Russia was making its choice between Kerensky and Lenin. Robins has been consistently and continuously anti-Bolshevik, in America and in Russia; but he saw the failure of our diplomacy in Russia; and he had a chance to perceive the reason, the instructive reason. He calls it the Indoor Mind. The Indoor Mind goes to a country like Russia, where 7 per cent. of the population had been masters of everything. It finds the 7 per cent. swept out of mastery and the 93 per cent. in full control, with twelve million rifles in their hands. But it gives itself to the 7 per cent. It gives itself to drawing-rooms, dinner-parties, tea-tables, palaces, boulevard restaurants. There it hears at last about a thing called a Soviet. But what does it hear? It hears that the Soviet is a deliberately wicked and artificial thing. It hears that the Petrograd Soviet of Workmen's and Soldiers' Deputies, and the Moscow Soviet, and the Irkutsk Soviet, and all the other Soviets springing up at almost every cross-roads all over the fifteen hundred miles from Archangel to Odessa and all over the six thousand miles from Kiev to Vladivostok, are produced by the machinations of the agents of the Kaiser. They are a German intrigue. That is what the Indoor Mind hears, and it believes it. And what turns out to be the fact? The fact, as proved by events subsequent, soon subsequent, turns out to be that these Soviets, instead of being a mere German intrigue, were a tidal wave of irresistible popular emotion, as spontaneous, as Russian, as a folk-song on the Volga. Never, says Robins, never in this age of emotions of peoples, in this age of movements of populations, will diplomacy be able to deal with foreign politics till it discards the Indoor for the Outdoor Mind. Robins' duties in Russia took him outdoors. By fate, by chance, he was obliged to go out among the Russian people. He was used to outdoors and to people. When I first knew him he had lately returned from gold-hunting in Alaska, where he had hunted successfully enough to be able to live in modesty during the rest of life without any further such hunting anywhere; and on the night on which he unnecessarily saved me from Socialism he departed, after three hours' sleep, to open up the Chicago Municipal Lodging House where he did his best to restore broken men to a sound life. He had known miners and he had known vagrants, and he had known fanatical Socialist reformers, and he had known solid middle-class reformers in the course of his labors with the Municipal Voters' League for the return of honest aldermen to the Chicago City Council. He had been a down-on-the-ground precinct-by-precinct political worker. Going outdoors in Russia did not hurt him. Through going outdoors, he found the Soviet---he knocked his shins against it---when diplomats were only hearing about it. 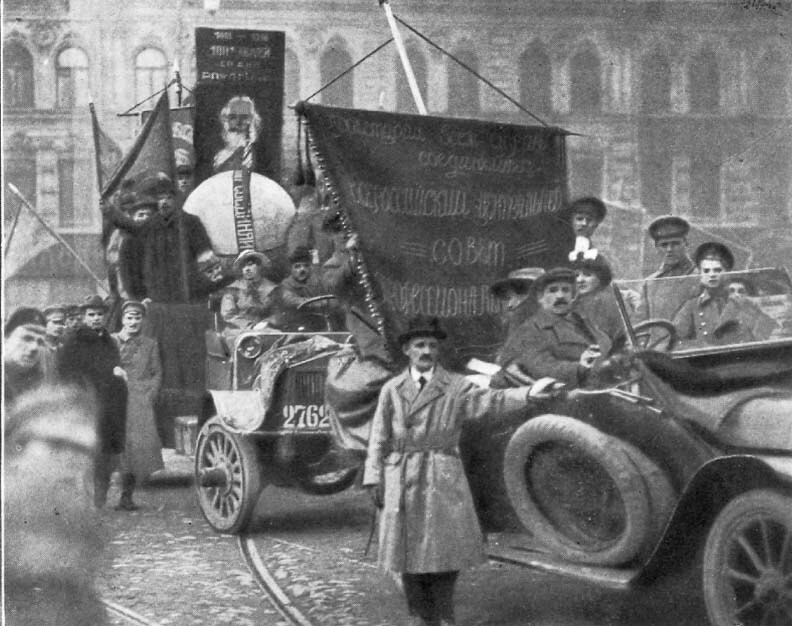 The Bolsheviks afterward, in order to capture Russia, had to capture the Soviet. The Soviet turned out to be the strategic, the vital, thing. Robins' narrative begins therefore with the adventures through which the Soviet was revealed to him. Certain hints of the Soviet were borne to the members of the American Red Cross Mission even while they were still in Siberia on their way from Vladivostok to Petrograd. At the Siberian town of Chita, just over the Chinese frontier, they were stopped and examined by a local government acting on its own responsibility. It called itself a Soviet. It consisted simply of elected representatives of local workmen and of local soldiers. Robins was not at that time the commander of the Red Cross Mission. But it was supposed, or hoped, that his familiarity with the labor movement in America might enable him to say the fitting word to the labor movement in Chita; and he was visited by a stroke of great good fortune. He remembered the day when he had taken part in a movement in Chicago for preventing certain Russian political refugees from getting deported from America back to Russia. He remembered the American Political Refugee Defense League, and Christian Rudowitz and Anton Pouren. They were not criminals. They were political opponents of the Czar. Robins was able to stand up in their country now, at Chita, and tell the story of their experiences in America. He had been secretary of the league formed to help them; and they had been helped. They were not deported back to Russia. They were permitted to remain in America. America was true to its tradition as an asylum, a secure asylum, for refugees whose crime was love of liberty. It was the theme for a good speech, and Robins was diplomatically fortunate in being able to make it, but he could not help reflecting on the curiousness of the forcible stopping of an official train by a local government. It was merely local, and it was altogether extra-legal. The legal government was the Kerensky government. The Kerensky government, centered at Petrograd, was operated locally through Dumas and Zemstvos and so on. This Soviet was a volunteer thing, really a private thing. But Robins was soon to find out that even under Kerensky it was the thing with authority, with power. The train proceeded westward and passed through Irkutsk; and then, at Krasnoyarsk, there was again a Soviet. The rumor came that this Soviet would also stop the train. The managers of the train dodged. They waited for a certainly clear track and for a quiet hour in early dawn, and they dashed through Krasnoyarsk without stopping. This Soviet at Krasnoyarsk was reported to be Bolshevik. Bolshevism had triumphed in a remote provincial town at a time when yet it could not raise itself to strike in Petrograd. The American Red Cross Mission arrived in Petrograd on August 7, 1917. Bolshevism was far indeed from triumph there. Trotzky was still, or had lately been, in jail. Lenin was in virtual hiding. On August 8th there was a conference between the American Red Cross and Kerensky; and then, on days soon following, Robins met Miliukov and Kornilov and Madame Breshko-Breshkovskaya and Prince Kropotkin; and all his immediate personal official associations in his Red Cross work came to be with the supporters of the Kerensky government against the Bolsheviks; and he thought no more about the Bolsheviks or indeed about the Soviet till his work obliged him to make a trip out of Petrograd. He had been assigned by the commander of the Red Cross Mission, Col. Frank G. Billings, to work particularly at the problem of food-supply and at the problem of war refugees. There were many war refugees in southern Russia. Robins was despatched to southern Russia. "There," as he says, "I first really sensed the new power, the new social binder, which was growing into existence all over outdoors in Russia." He came to Ekaterinoslav on the Dnieper, not far from the Black Sea; and he came to Kharkov; and he found Soviets. He found them feared by the 7 per cent.---the 7 per cent. who used to have a monopoly of mastery; and he found them bitterly hated and despised. He was told that in these Soviets, assuming to practise the arts of government, were men who just a few minutes before had been common miners. This news perhaps did not work on Robins in the manner intended. His horror was perhaps modified by the reflection that he himself had been in his youth a common miner. He used to work twelve hours a day, and in the winter-time he went down underground before the sun was up, and he ate lunch with the mules, and he came back to the surface after the sun had set, and he never saw the sun at all for weeks, and he got a dollar a day, and he is frank to admit that he needed no agitator to tell him he was working hard and getting little for it and had a grievance. I dare say that he calculated that these Russians could likewise perceive grievances and could likewise perceive the desirability of a little organization without being entirely dependent upon agitators for the idea. But they had gone quite beyond a little organization in Kharkov. They had gone quite beyond the making of trade-unions. These organizations of workmen and of peasants, in Kharkov and its neighborhood, were veritably governments. When Robins wanted to get anything really done he had to go and talk to them and make arrangements with them. His pockets were full of Kerensky credentials. They were full of authorizations from the government of Petrograd. When he presented any such document, he was treated kindly, but he was treated rather pityingly, as if he were a child showing a letter from Santa Claus, authorizing him to have a train. It happened that Robins did want a train. He wanted several trains, to carry his Red Cross supplies. "But," said people, "if you really want trains, you must see the men in the Soviet." And it was so. The Soviet was master now. From the Soviet, not from the regular authorities, Robins got the trains and also the farm-wagons that he needed. If the men in the Soviet said he could have the farm-wagons, he had them. If they said a train could set forward, it set forward. And if they said it could not set forward, it could not and did not set forward. By proof of fact these Soviets had authority. They had the power. Robins went back to Petrograd much more enlightened. but also much more disturbed. On his way back he passed through Moscow. He had passed through Moscow before, on his way out down south to Ekaterinoslav and Kharkov. The great Moscow All-Russian Conference of August, 1917, had then just been in session. Its results now recurred to him with redoubled force. There were two chief results. The first was seen in the demeanor of a certain set of delegates. They sat by themselves compactly. They behaved compactly. Alone in the great hall they seemed to constitute a body of opinion knowing exactly what it wanted and knowing exactly how it proposed to get it. In the midst of a Russia of irresolution and of indecision they were clear and emphatic. They were ominous. They were the delegates from the Soldiers' and Workmen's Soviets. The other result was smaller, but more dramatic, and it had consequences more immediate. On the last day of the conference there was a scene coming close to a physical encounter. A group of Cossack officers were challenged in statement by Kerensky. They challenged him in turn. There was a storm of words, short, sharp. In its lightning the cleavage stood clear between Kornilov, the Cossack, the general soon to lead a revolt for "law and order and discipline," and Kerensky, the man in office, the man forced to compromise between the wishes of the Allies for "law and order and discipline" and the wishes of the Russian people for bread and land and peace. By the time Robins got back to Petrograd the Kornilov revolt was in full swing. That is, it was swinging as much as it ever did or could. The Allied embassies and missions had been able to hear it about to swing thunderingly through the whole country from the Black to the White seas. Instead, it barely moved. It simply creaked and stopped. As Robins puts it, the Indoor Mind had guessed wrong again. In the Allied embassies and missions, Robins goes on to point out, there were numbers of men of the highest native ability and of immense experience and of the finest character and patriotism. It was their business to judge public events. That was their specialty. They were in Russia to guide their governments regarding the facts of Russian affairs. They earned their living doing just that sort of thing. Yet virtually every one of them, in sympathy, in policy, in influence, was with Kornilov. Virtually every one of them put his money, so to speak, on Kornilov. And they were all wrong. They were betting the diplomatic favor of their countries on a horse that had no chance. In the mean time there was in Russia an American business man, a copper operator. He wore an American uniform. He had become, for the time being, a colonel, in command of an American mission. He was head of the American Red Cross in Petrograd. Colonel Billings, the first head, had been obliged to return to America. He was succeeded in Petrograd by Col. William B. Thompson. Colonel Thompson never took any stock in the Kornilov adventure at any time at any price. He was not a trained observer of foreign political affairs. He was a copper man. He was a financier. He was absolutely without diplomatic experience. Yet he went diplomatically absolutely right. Quite naturally, says Robins. Colonel Thompson used the methods of simple human inquiry, the methods of outdoor fact, instead of the methods of indoor gossip and surmise. By dwelling on fact he helped Robins to see that adventures like Kornilov's were impossible in Russia at that time. Kornilov was appealing to the sentiment of law and order and discipline, and he needed a middle class. There was no such class in Russia. There was the 7 per cent., and there was the 93 per cent., and there was virtually nothing in between. The 93 per cent. were not interested in law and order. They were interested in the land-control and in the factory-control they thought they ought to have. They were an under class, rising, and willing to rise, by violence. They were not a middle class, resting on acquired property and responsive to a law-and-order program. There was no such class, and there was no such response, in Russia. The Allies were whistling to it, but Colonel Thompson knew it would not come because it was not there. It might not have been expected that Thompson and Robins would come to an agreement about Russia. But they did. They came to an absolute agreement. They agreed with regard to the prospects of the march of Kornilov, and they agree now with regard to the whole Russian situation in general. It is remarkable, and it is also among the most convincing circumstances in the record. They came to the same view from widely separated stations of vision. As Robins says, they look at life from altogether different windows. Thompson is a man of great wealth, of great Wall Street wealth, a supporter and an organizer of the effort to get the Republican nomination for Elihu Root in 1916. When he first heard that Robins was to go to Russia with him, he revived to say: "That uplifter! That labor agitator! In the Red Cross Mission?" He was not pleased. Robins, for his part, is willing to say that Thompson and he did not come to their first meeting with any profound feelings of mutual esteem. They soon found, though, that they agreed on one thing fully. They agreed that you could not abolish facts by sitting and dreaming in palaces. They agreed that you could not make an army for Kornilov in Russia by sitting and imagining a social class and a political motive which outdoors in Russia did not exist. 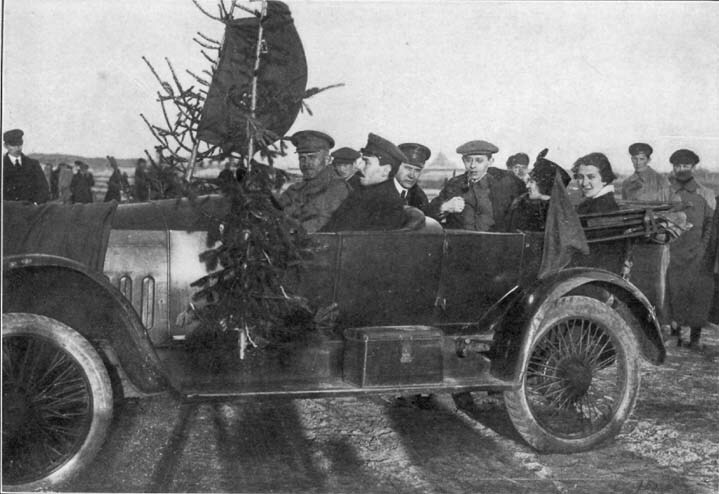 Kornilov arrived in Pskov, on his way to Petrograd, with only 40,000 men. The next morning 20,000 of these 40,000 refused to go farther. Kornilov surrendered. Not a shot was fired. Kornilov's army was simply poisoned and disintegrated by the new Soviet culture. It was the Soviet, not Kerensky, that won. Kerensky was in the Winter Palace. The Soviet was in Smolny Institute. Kerensky issued a proclamation, and effectively ceased. Smolny vigorously acted. It was from Smolny, not from the Winter Palace, that the orders issued which brought sailors down to Petrograd from Kronstadt and bivouacked them in the Field of Mars. It was from Smolny, not from the Winter Palace, that the energy came which dug trenches in front of Petrograd and lined the tops of Petrograd's buildings with machine guns. It was from Smolny that Bolshevik sailors went to the Winter Palace and dismissed the Cadet Guards there on watch and took their places and guarded Kerensky himself. Finally, and overwhelmingly, it was from Smolny that the arguments went out, the propaganda, the words, the philosophy, which disintegrated and dispersed Kornilov's army more than rifles or threats of rifles. Even the Mohammedans took part in that combat of words. 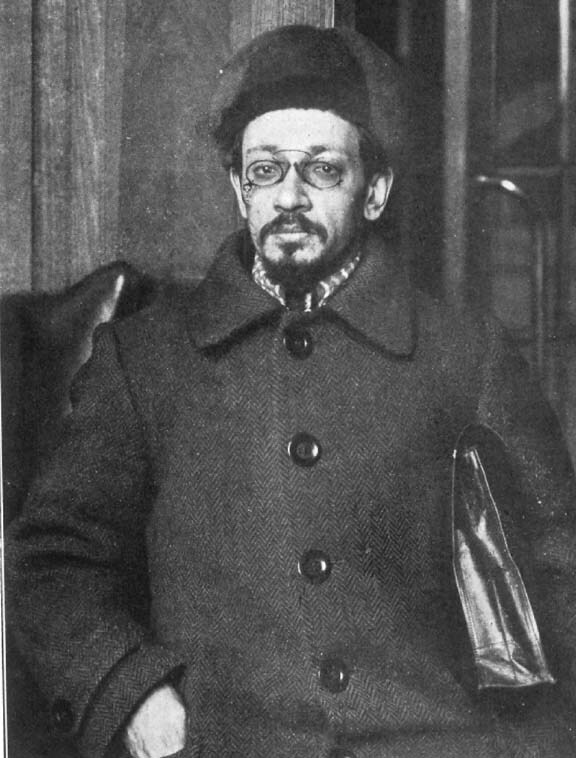 Robins has led a life of amazements, but there has been no more amazed moment in it than when he learned that the Executive Committee of the All-Russian Mohammedan Soviet was taking a hand in repelling Kornilov by going out from Petrograd through delegates to have a little philosophical chat on class-consciousness with the "Savage Division" of Mohammedans in Kornilov's army. These methods, taken together, were successful. Kornilov's soldiers did not fight. It was a bloodless folk-victory. It was a victory for the Revolution. It was a victory for the Soviet. Thereafter men's eyes turned increasingly toward the Soviet and toward Smolny. Smolny, in Petrograd, was seen to be the nursing source and the radiating center of power. But whatever helped the Soviets helped the Bolsheviks. Just as the Soviet was more energetic and definite than the rest of Russia, so the Bolsheviks were more energetic and definite and purposeful than the rest of the Soviet. And Robins soon had a new and disheartening exhibition of their constantly enlarging power and skill. An All-Russian Congress was called. It bore the name of Democratic Conference. It did not represent simply the soldiers and workmen and peasants. It represented other groups as well. It had delegates from the zemstvos and from the food committees and from the co-operative societies and from the municipalities. It met toward the end of September. At first the government got on quite well with it. Kerensky made it a speech, and was enormously applauded. The conference seemed to be for the government. It seemed to be for the war. But then the generalship of the Bolsheviks began to tell. In the notes Robins made at the time I find he jotted down the "platform generalship" of the Bolsheviks and their "real work with delegates." They worked really, realistically. They were not content with orations. They argued man to man, on the floor, getting votes. They were tireless, on the floor as well as on the platform. And there, on that platform, Robins had his first sight of Trotzky. Trotzky was walking up and down. The spectacle of that platform, as I get it from Robins, could be said to be arranged in three tiers. First, farthest toward the back, was the presiding officer, the chairman. Below him was a row of men at a table. These men were the "Presidium." They were delegates selected from the different groups sitting in the convention to represent all groups together and to keep a sort of composite neutral watch on the proceedings. Russians seem to have a passion for proportional representation. At their conventions they like to have a proportionally selected "Presidium." There it sat in a long row. It was the second tier. Finally, below it, between it and the audience, was the speaker. It was Trotzky. He was walking up and down, slowly and calmly. He was not speaking. It was impossible for him to speak. People in the audience were speaking. They were speaking to him; and they were speaking severely and loudly. The words they used were "pro-German" and "German agent" and "spy" and " traitor." They roared. Trotzky walked up and down, and stopped, and pulled a cigarette from his pocket, and pulled a match, and lighted the cigarette, and smoked, and walked up and down. 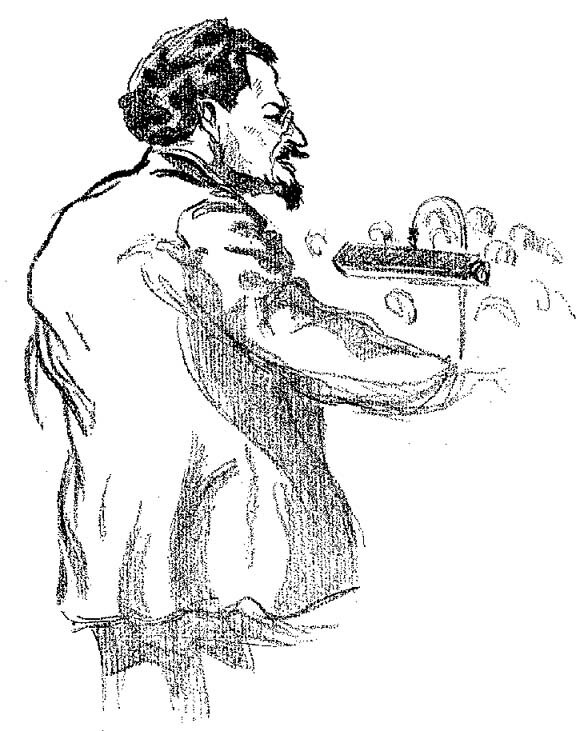 One man in the audience, to Robins' personal knowledge, had a gun with which, as he confided to his friends, he would shoot Trotzky as soon as Trotzky appeared. He did not shoot. Trotzky smoked for quite a while. Then, when there was a lull, he raised his arm and lashed that audience into complete subjugated silence. Robins has heard many speakers. It has been part of his occupation to speak; and it has been almost part of his occupation to listen to speakers, to seek them out in order to listen to them. He has listened to them in this country and abroad. 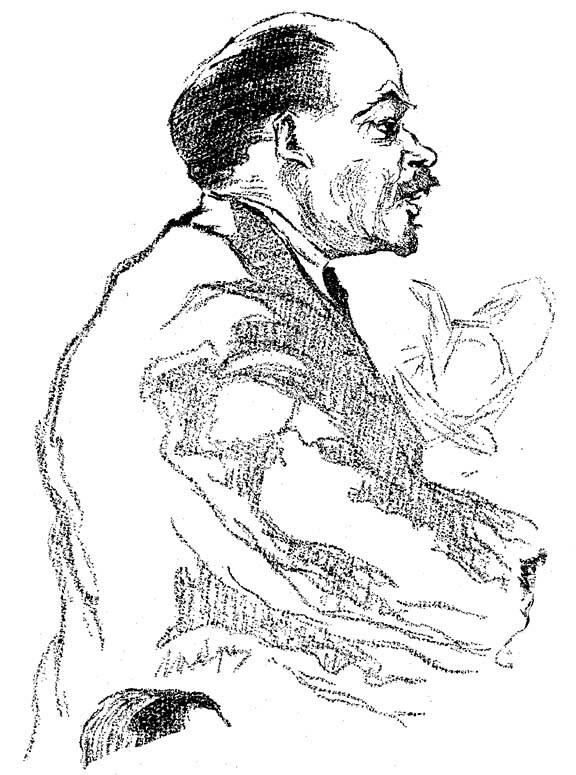 Besides himself practising the arts of public speaking on street corners and in ward conventions and in the pulpits of churches on Sunday mornings and in world-tours of the Men-and-Religion-Forward-Movement and in trade-union councils, and elsewhere, he has professionally watched those arts in others. Even his enemies will admit him to be a judge of speaking. I gather from him that he is obliged to make a professional bow to Trotzky. He says that as a speaker he has never seen Trotzky's equal in the conquering of an audience, in the carrying off of it, on flights of passion, or flights of the mystery of the instant weaving of patterns of words. Trotsky has cleverness, and he has vehemence. He sprays the poison of his ideas upon his hearers with a penetrating force which even Robins' sophisticated attention was stunned by. Robins could detest nobody's ideas more than Trotzky's. The one man is an individualist and a preacher of religion. The other is a communist and a preacher of materialism. Their one point of contact is oratory. On that point Robins is inclined to regard Trotzky as unfortunately the world's champion performer. Facing the Democratic Conference, Trotzky did not even bother to refer to the words "pro-German" and "German agent" and "spy" and "traitor." He paid no attention to them. He plunged straight into Bolshevism and into the Bolshevik program, and spoke for the program; and it began to win. Through Trotzky, through Kamenev, through Riazanov, through Stecklov, through hard work, through hard talk it began to win. Before that convention was over, among delegates who had started pro-government, the Bolsheviks had almost won an open anti-government victory. As it was, they won a covert victory. They succeeded in getting the convention to vote down a resolution in favor of "Coalition with the Cadets"---that is, a resolution in favor of the Kerensky kind of government. They succeeded in getting the convention to refrain from indorsing the "Cadet Coalition" idea. And they succeeded in securing the withdrawal of the resolution in favor of the war. It was withdrawn under their fire. Their spirit dominated the close of the conference. For Robins, for any pro-war man, for any man as nationalist as Robins, it was an ending most miserable, most foreboding. The audience stood, unregardful of national Russia. The resolution for the war was gone. It was buried. The audience stood and sang the song, the hymn, called "The International." They sang it for their message. It was their word. They had no word for Russia. They had no word for the army. They had no word for the fight against the Germans. They had "The International." It might have been sung in Germany. It is to-day being sung in Germany. It was sung that night in Petrograd with the souls of the singers. It was the symbol of the triumph, covert and indirect, but still a triumph, of the Bolsheviks in that Democratic Congress of All Russia. Robins listened, and went away, and went to work. He went to work against the Bolsheviks. Or, rather, he went to work against the peace movement in Russia. "If I do not know more about the opinions of the common soldiers and of the common workmen who made the Bolshevik revolution of 1917 than any other foreign representative then in Russia, it is because my intelligence was not equal to my opportunities." He had the opportunities, and he did not neglect them. When he saw that Trotzky was a power in the Democratic Conference he did not evade him. He went to where he was. He walked up to him and talked to him, just as in Chicago, when he was head resident of the Northwestern University Settlement and afterward member of the City Board of Education, and then member of the City Charter Convention and chairman of the State Committee of the Progressive party, he talked to more different sorts of people, radical and reactionary, sacred and profane, than anybody else had ever collected into one acquaintance. More even than being a professional speaker and preacher, Robins is a professional collector of people and of people's opinions and ideas. Having seen him gather them in Chicago, all the way from the white right wing of the City Club to the red left wing of the Chicago Federation of Labor, I can readily see him, with his characteristic gait, as of an Indian on the trail, gathering them tirelessly in Russia---and systematically. Every day he had before him on his desk, translated by a corps of Russian assistants, all the opinions of all the Russian newspapers regarding any matter of interest to America. He suffered nothing in the way of printed opinion to escape him; and he also gave himself to the study of that much more elusive kind of opinion, spoken opinion. He studied it especially among the workmen and among the peasants in the organization destined to speak the final revolutionary word about Russia---the workmen and peasants in the great demobilizing Russian army. He noticed in that army a certain number of heavily armored motor-cars. They were fortress-cars. They amounted to tanks. Robins watched them roll down the streets of Petrograd and compared them with civilian pedestrians, and even with military machine-gunners, and he regarded those tanks as the center of physical power in revolutionary Petrograd. In many other parts of the army he now had friends who carried to him continuously the spoken words of the private soldiers. But he was especially careful to have friends in the tank corps. He communicated with private soldiers and they communicated with him. Some of the things he learned from them I shall soon relate. They gave him the knowledge he most valued. He knew Kerensky's government through scores of intimate official conferences with members of it regarding the work of the Red Cross. But he was most especially and particularly careful to know the feelings of the rank and file of the Russian 93 per cent. Therefore with some confidence he ventures to say that he knew something about the peace movement among the Russian soldiers, as well as something about the Bolshevik propaganda among them, and he gives it as his considered opinion that the Bolshevik propaganda was indeed urgent and active, but that, after all, it was much like the case of a man blowing with his breath in the same direction with a full-grown natural tornado. Unless that fact is considered and frankly faced and admitted, says Robins, it is impossible to understand what happened afterward or what is happening now. A thick darkness of misery, of mental misery and of physical misery, more than any darkness of propaganda, was driving Russia toward peace. If we could even begin to take the measure of that misery, we could then also begin in some slight fashion to take the measure of the shut-eyed and shut-hearted stupidity which attributes the agonized convulsions of peoples in Russia and in Hungary and in Austria and in Germany to agitators and to pamphlets. In Russian the industrial directing brain of the country was almost gone. Much of it had been German. When the war came, the Germans went. Some of them went back to Germany; and some of them sank down into Russia and lived submerged. In either case they ceased to help to manage Russian business for Russia. Then came forward the Russian part of the 7 per cent., the truly Russian part of it, out of the nobility, out of the universities, out of the professions, out of businesses. They volunteered to help organize the food-supply and the clothes-supply, and even the munitions-supply. Their spirit was magnificent and their service invaluable. They saved Russia from collapse and ruin during the first two and a half years of the war. But then came the revolution, and then came the Soviet, and then the whole 7 per cent. became suspect. To the Soviet the whole 7 per cent., as a mass, was counter-revolutionary. The Soviet wanted "the fruits of the revolution." It wanted all land for the people. It wanted all industry for the people. It wanted outright Socialism, and wanted it at once. The 7 per cent. did not. The Soviet excluded the 7 per cent. But the Soviet was coming to rule Russia. Even under Kerensky, as Robins had seen at Kharkov, and as he now saw at Petrograd, the Soviet was coming to be the real government. Therefore, when the 7 per cent. was excluded from the Soviet, it was excluded, more and more, from the real government, from the real direction of Russia. Russia, having lost the German part of its directing brain, now began to lose most of the experienced native Russian part of it. More and more it had no directing brain at all, no brain experienced and skilled in the technical directing processes necessary to the production and distribution of commodities. So Russia began to lack food and raiment and fuel. In its great centers of population and of demand and of need, Russia began to be underfed and underclad and underwarmed. It began to suffer, at first slightly, then horribly. It stood in the gale of the World War with an empty stomach, shivering and angry. And the Allies said, "Fight!" "Who made us fight? The Czar. What did the Czar want? The Dardanelles. What do we care about the Dardanelles? Nothing." "Why do the Germans fight? Because the Kaiser makes them." "Why do the Allies fight? Because their rulers make them, by conscription. What do their rulers want? They want Syria for France and Mesopotamia for England and some Greek islands for Italy. When we ask them why, when we ask them to speak their full mind, they say this is no time for speaking." "We will speak. We will speak to everybody. We will speak to the Germans. They are workers and peasants, too. Nine out of ten of them are workers and peasants. We do not want their land. They do not want ours. We will speak to them, and when we speak to them and tell them what is in our hearts, they will not fight us any more. Why should they?" Perhaps only Russian peasants, if one may believe what one conventionally hears about them, could have been so beautiful and so silly. Of course, the day may come when beauty will fill the world, and the silliness of men is said to be one of the means of Providence to the dawning of that day. There is some such hint in Scripture. But no such day was shining in 1917. In 1917 Robins was solidly certain that Ludendorff's troops would not lay down their arms at the approach of arguing Soviets, even if the Mohammedan Soviet went along with its most cogent and convincing thoughts. Robins cast about, therefore, for arguments with which to combat the arguments of this fanatical but natural peace movement and with which to persuade the Russian soldiers that it was really actually practically necessary for them to fight. The Allies, of course, were conducting a propaganda in Russia. All governments were conducting propaganda everywhere, and whining because other governments were conducting it. The propaganda of the Allies in Russia was simple. It was simple-minded. It proceeded on the theory that what the Russians wanted to be sure of was that the Allies would win. The fact was that what the Russians wanted to be sure of was that the Allies were fighting for good ends and not simply for territorial ends. The Allied propaganda, perhaps, did not even know that fact. It assumed that the Russians were looking for the band-wagon, and that if they saw that the Allies had it, they would at once climb back aboard on the Allied side. Therefore the Allies got out propaganda in Russia dealing almost entirely with their terrific physical strength. France had better artillery, and presumably more of it, than any other nation in the world. The British fleet sailed the seas defiant and dominant and undefeatable. America was sending airplanes to Europe in numbers to darken the skies. America, in hundreds of shipyards, was building thousands of ships to carry millions of men to Europe in a few months. The Allies were bound to win. The Russian soldiers looked and said, "Let them." They said: "We have lost more men than all of them put together. We have taken our turn at it. If they are so strong, let them go ahead and finish it." This sort of thing, the American Red Cross Mission thought, was a dead loss. Colonel Thompson decided to try to organize a new effort. He gathered together a group of representative and powerful Russians. It was agreed that a great educational work, a great and friendly and legitimate educational work, could be and ought to be conducted among the Russian people. The aim of it should be to show the Russian people that on their own behalf, without any reference to the Allies, it was necessary for them to fight the German Kaiser. "The one imperialistic power which is next door to you, and which is able to conquer you and which is actually trying to conquer you, is the power of the Central Powers. Its soldiers are advancing. You cannot stop them with Socialism. They knew Socialism before you knew it. They are hypnotized by the Kaiser and by false patriotism. They are mad. They keep coming on; and with them, as you know, as you can see, on comes the old day once again in Russia. Wherever the Germans go, the old day goes with them. Back of the German bayonets are your own Russian barons, returning to take from you the land which is yours by the Revolution. Back of the German bayonets are your own old industrial masters, returning to give you the old twelve hours a day and the old two rubles a day instead of the eight hours and the fifteen rubles of the Revolution. Back of the Kaiser is the Czar, the Kaiser's kin, returning to destroy the Revolution itself. To keep the Czar down, to keep the revolution up, you must fight the Kaiser." Madame Catherine Breshko-Breshkovskaya, grandmother of the revolution, anti-Bolshevik. 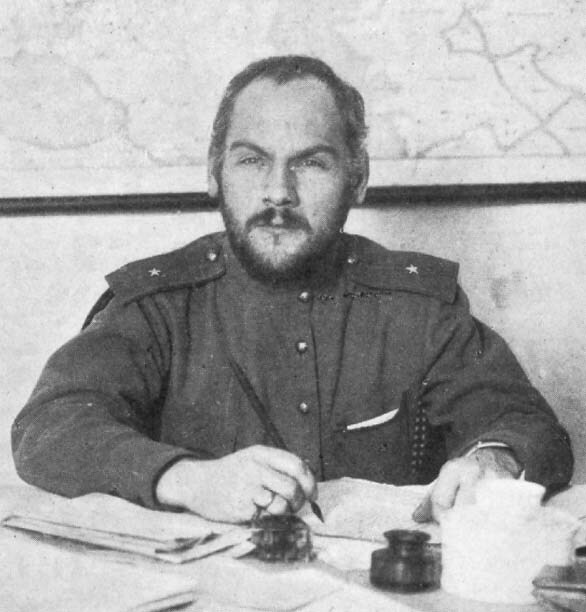 Nicholas Tchaikovsky, leader of the peasant co-operatives, afterward head (under the Allies) of the Government of the North in the Archangel district, anti-Bolshevik. Lazarov, formerly manager of the revolutionary "underground station" in Switzerland, anti-Bolshevik. General Neuslochowsky, one of the most trusted of Kerensky's generals, anti-Bolshevik. David Soskice, Kerensky's private secretary, anti-Bolshevik. Such was the committee. It was strong in personnel, but it was weak in money. Colonel Thompson attended to that detail. He provided money to the extent of a million dollars. He deposited, in a bank at Petrograd, to be drawn on by the committee, an immediate fund of a million dollars out of his own private fortune. "I repeat to you what I said to the Senate Committee under oath. Colonel Thompson never contributed one cent in Russia to the Bolsheviks. But he did contribute one million dollars against the Bolsheviks. He contributed one million dollars of his own money to an organization for educating the Russian people to see the menace and the peril of the peace the Bolsheviks were advocating." That organization got under way. The Kerensky government co-operated. Men were released from the civil service and from the army, men of character and of persuasiveness, to go out and spread the truth---the truth expressed in the indubitable fact that a victory for Germany would be a victory for the counter-revolution. One million dollars, however, though enough for starting, was not enough for continuing. The project was one for the reeducation of a whole people. No private fortune was adequate to it. Colonel Thompson, therefore, cabled to Washington. In cabling he explained his enterprise and he also explained the need of it in the Russia of the moment, dwelling on the danger that Russia might be hurried into peace and Bolshevism within a short time unless Russian public opinion could be reached and changed. He asked for one million dollars within ten days and for three million dollars a month thereafter during a period of three months. He cabled. A week passed. Two weeks passed. Three weeks passed. Then a voice was heard from Washington saying that the idea suggested by Colonel Thompson was being carefully analyzed in Washington, and might be adopted, but that in any case a perfectly good representative of the Committee on Public Information would soon be on his way to Petrograd. 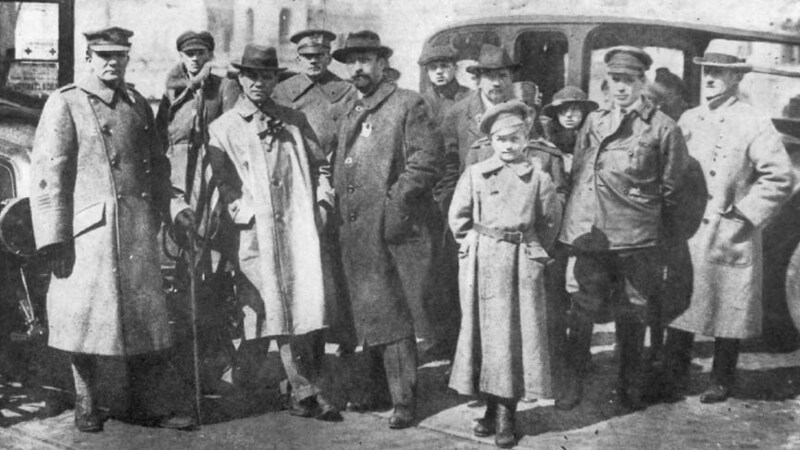 When the representative of the Committee on Public Information arrived in Petrograd, the Bolsheviks had been in power in Petrograd and in full control of the whole Russian situation for more than two weeks. Deprived of support from Washington, Colonel Thompson's Russian Committee was obliged to revise its work and to taper it off. In the mean time the peace movement and the Soviet movement and the Bolshevik movement were all of them every day growing stronger. Robins now had an especially good opportunity to watch them. He began to make regular scheduled public speeches to meetings of soldiers. He had already spoken to soldiers occasionally; but on September 18, 1917, he began to speak to them daily, and he continued to speak daily until the Bolshevik revolution broke and stopped him. At armories, at arsenals, at barracks, in Petrograd and in the environs of Petrograd, he stood up and spoke at length through an interpreter, telling his hearers about America and about America's government, and about the reasons why America went into the war. He carried his message to many thousands of Russian workmen and peasants still in the army, and they were interested. They were interested particularly in the subject of education in America. Our Western state universities amazed and delighted them. The fact that a poor boy could go all the way through the common school and then through the high school and then through the university, paying no tuition anywhere and getting a whole education by free grant of the state for the future benefit of the state in citizenship, was thrilling to them. Robins made the most of our democratic opportunities in education and of all our other democratic opportunities for individual advancement. He also made the most of the democratic support given in America to the war. He would call his hearers' attention to the fact that our business men did not need to go into the war to make money. They were already making money, large quantities of it, selling goods to the Allies; and they were making it without having to pay any war taxes of their own to their own government at Washington. Now, having gone into the war, they would have to pay heavy war taxes. That fact proved that our motive in entering the war was not commercial. His hearers would listen attentively. Robins would speak for thirty minutes, and would then answer questions for two hours. After testing audiences in many parts of the world, Robins has come to the conclusion that a Russian audience can stand more punishment than any other audience living. The peasants and workmen who listened to him in armories and arsenals and barracks were willing to listen, and also to talk, to the end. Some of their questions, some of their statements, I have copied out, and I here reproduce from Robins' notes. "Comrade, please say that we are grateful to the American Red Cross for its brotherly help." "Comrade, please send our brotherly greetings to the working-men of America and tell them it is our deep wish that they support us by sympathy with our emancipation." There would be many such expressions, but they would be followed by questions showing an instinctive suspicion of "capitalism" everywhere, including America. "Comrade, we hear that in America strikes are broken by using policemen and soldiers against them. Is this true? Why is it true?" "Comrade, are there any workmen and peasants in the American government? Are there any Socialists? How many? " "Comrade, in America does not the capitalist get the surplus value of the labor of the working-man?" The intention of such questions was unmistakable; and then, passing to the war, there would be questions indicating a profound dissatisfaction with Allied, and also with American, diplomacy. "Comrade, why does the American government refuse passports to Socialists who wish to go to Stockholm to talk with the Socialists of the world?" "Comrade, why does America support France and England in their desire for annexations, and why does it not urge them, as we urge them, to adopt the principle of no annexations and of the self-determination of all peoples? " "Comrade, why do not the Allies, why does not America, make a full and frank and direct reply to the questions asked by Russia regarding the aims of the war?" So they went on, always, in the end, toward revealing their anti-war drift. Always, in the end, they showed their distrust of all "capitalistic governments," and their suspicion that the aims of the Allies were selfish and sinister, and their essential conviction that the war was a "bourgeois" war, and that the Russian proletariate had no proper place in it. They would usually express these views very politely, but sometimes they were restive, and now and then they seemed inclined to rise and sweep Robins from their presence. He was speaking one night in a great military building at Gachina, some thirty miles from Petrograd. He has reason to remember that building distinctly. It had a high, curved, dark roof; and it was lighted flaringly and yet dismally, with spots of brilliance and with great areas of shadow, by oil-flame torches. The speaker's stand was reached by a ladder. Robins climbed the ladder and got into the stand and spoke. I dare say he contrasted strongly with the Russians before him. He is among the Americans on whom the American climate and environment have perhaps already had a physical effect. His complexion is quite dark, with not a little in it, I should say, of a coppery coloring; and his black hair has an Indian straightness; and his eyes have the searchingness of the forest and the prairie; and the contours of his face have a weathered suggestion of the modeling done by America on the faces of those who preceded us in our present hunting-grounds; and, finally, perhaps just by chance, perhaps in order to mislead the observer into making groundless generalizations about climate and environment and into seeing resemblances which do not exist, it happens that his very oratory, in its gestures and in its actual words, in the simplicity of them, and in the art which turns simplicity gradually into stateliness, is that of a sachem traditionally addressing an assembled tribe. In Russia he was perhaps at least unusual. At Gachina, however, he was not popular. But he was not surprised. Everywhere, among all the soldiers, his arguments had been growing in unpopularity. So, feeling quite accustomed by now to a certain hostility, he persevered. On the subject of American institutions he was listened to in silence, not without some respect; but on the subject of American diplomacy and of Allied diplomacy he began to be interrupted; and on the subject of the war in general and of Russia's participation in it he began to be mobbed. Masses of men seemed to rise in a black wave toward the stand. There Robins stood, with a Russian officer, high and dry, but not happy, while great shouts of "Imperialists" came at them and a great multitude of arms waved the shouts on. Robins did his immediate best to get those arms to subside. After a while, when they seemed less numerous and less earnest, he called to the Russian officer for the ladder, and he descended. And then he got an evidence of a certain peculiar boisterous good humor in Russian people. As he made his way across the hall toward the door at the other end of it, he saw a compact group of soldiers running at him. He thought he knew their purpose. But he was in error. Instead of being picked up on their bayonets, he was picked up in their arms, and they began to treat him to the ceremony which they visit upon their leaders on occasions of special approval and affection. They tossed him in the air and caught him, and tossed him and caught him again, and then again and again. With the second or third toss he began to perceive that he was not being killed. He was being applauded! Seldom, I imagine, has he had more satisfaction in surviving to say: "Gentlemen, I thank you." But those soldiers were not for the war. They wanted to show Robins that no personal hard feelings were being entertained, but they were not for the war. At Gachina and at virtually every other armory and arsenal and barracks that Robins visited his hearers were cold to the war. Coming back from addressing the Machine-Gun Corps at Stalna on October 22d, I find he made this despairing note in his diary: "The war is dead in the heart of the Russian soldier." The one thing living in that heart was the revolution, and the one thing toward which that heart turned for the full success of the revolution was the Soviet. Lenin and Trotzky put those two facts together---the revolution, the Soviet. By that combination they opened the door to their triumph. Robins expresses it by saying that the Bolsheviks won Russia with five words. They said, "All Power to the Soviet." It was a formula, a slogan, that had nothing to do directly with land or with industry or with war and peace. It had to do simply and entirely with what sort of government Russia should have. Lenin and Trotzky realistically perceived that the Soviet, at that time, in fact, was Russia's one effective public authority; and they unswervingly proclaimed that it should be supreme. Over and over again, tirelessly, they said, "All Power to the Soviet! " Other things might or might not be. One thing, said Lenin and Trotzky, had to be. "All Power to the Soviet." "The men are still divided about half and half between liking Kerensky and liking Lenin. But they are unanimous on one point. They are unanimously for the Soviet." Kerensky is for the war. Therefore we Americans, we Allies, want Kerensky to stay in office. But the Soviet is the power. Russia will not stay in the war except through the power that really rules it---except, that is, through the Soviet. Therefore Kerensky must accept the Soviet and, with his authority, with his reputation, lead it---and lead it, if he can, his way, forward into the war. It was the one possible plan in reason, but it turned out to be altogether not possible in practice. Kerensky, to be sure, seemed willing enough. He seemed to understand the situation. He seemed to be doubtful of just one thing. He seemed to be doubtful of the willingness of the Allies. He seemed to be doubtful of their willingness to recognize the existence of the Soviet. Colonel Thompson decided to test the Allies out. He invited certain Allied representatives to meet him in his rooms at the Hotel Europe. They came, and they expressed the sentiments which were the final sentence of death in the Kerensky chapter in the history of Russia. General Knox, military attaché to the British embassy at Petrograd and chief of the British Military Mission. General Niselle, holding the same position at Petrograd for the French. General Judson, holding the same position for the Americans. Colonel Thompson, and, as his aide, Major (not yet Colonel) Robins. Colonel Thompson opened the meeting by making a brief statement of the crisis and of the instant need of action. Then General Knox took the floor. General Knox was not interested in the Soviet. He wanted to talk about the Kerensky government. He did so. He narrated the Kerensky government's historic frailties and futilities, at length. Everybody present knew them, but General Knox wished to remind everybody present. In particular he seemed to wish to remind General Neuslochowsky and Mr. Soskice. He left nothing out. At any rate, he seemed to Robins to leave nothing out. But then General Niselle took the floor. He remembered several faults of the Kerensky government which General Knox had forgotten. He mentioned them. With the Soviet knocking at the ramparts, General Niselle remembered all the troubles inside the ramparts. General Judson, the American general, was an entirely different sort of person. General Niselle, bound by the chains of his environment, seemed to remain a perfect indoor person to the finish. He finished by reciting the Russian military disaster at Tarnopol and by expressing the view that Russian soldiers were cowardly dogs. Both Russians present, General Neuslochowsky and Mr. Soskice, left the room. They would listen no longer. They departed red, and also seeing red. They were through. But General Knox was not through. He entered on a colloquy with Robins which I think I can exactly recite. General Knox was thoroughly honest, thoroughly patriotic, thoroughly intelligent. He simply apparently had not informed himself. When Robins thinks of General Knox's opinions and statements on that day in the Hotel Europe, he is inclined to grasp at the thought that every diplomatic and military mission in the world ought to get a cable every morning saying, "Unless you go outdoors to-day, unless you find something outdoors to-day, among the common people of the country to which you are accredited, you will be dismissed at nightfall." General Knox said to Robins, "You are wasting Colonel Thompson's money." "If I am, General," said Robins, "he knows all about it." "You should have been with Kornilov," said General Knox. "You were with him," said Robins. The General flushed. "Well," he said, that effort may have been premature. But I am not interested in the Kerensky sort of government. Too weak. What's wanted is a military dictatorship. What's wanted is Cossacks. These people need a whip. A dictatorship's the thing." Robins expressed the fear that they might get a dictatorship in Russia quite different from the kind of dictatorship General Knox was thinking of. "What?" said the General. "You mean Lenin and Trotzky? Bolsheviks? That soap-box talk? Colonel Robins, you are not a military man. I'll tell you what we do with such people. We shoot them." Robins was a bit roused probably by this time. "You do," said he, "if you catch them. But you will have to do some catching. You will have to catch several million. General, I am not a military man. But you are not up against a military situation. You are up against a folks' situation." "We shoot them," he repeated. That was Friday. On Monday, three days later, the Bolsheviks took the Fortress of Peter and Paul in Petrograd, and also the Arsenal. On Tuesday, Robins spoke for the war at the Orenbaum barracks, and the Bolsheviks did better. They took the telegraph station and the telephone station and the principal railway station. On Wednesday, in the evening, Robins stood on a bridge across the Neva and watched Bolshevik sailors from Bolshevik ships firing shells in the air to explode over Kerensky's Winter Palace. For Robins it seemed just about the end of the world. He was seeing Kerensky go down and Russia go down and the war against Germany go down, and therefore the whole world go down, with everything humanly supremely worth while in it defeated and lost. So he thought at the time. A mighty nation, and the world with it, was falling to pieces before his eyes under the fire of a new and incalculable social engine---the Russian Soviet. He looked around for General Knox to shoot these Soviet people, or for some other stern resistance to them. There was none. That morning at two o'clock, at Smolny, the Soviet people met in their Second All-Russian Congress and decreed All Power to the Soviet and All Land to the People and All Industry to the People and elected to power the man---Lenin---who has held that power from that moment in November of 1917 to this moment in April of 1919. But on the bridge across the Neva Robins made up his mind to a policy. He made up his mind that no matter where the power went he would follow it and look at it and see if in any way it could be made to serve the war and to serve the cause of the Allies and of the United States. Adopting that policy and executing it, he came to the next chapter of his experiences---an intimate acquaintance, such as no other American or Allied representative for a long time even tried to get, with the government of Lenin.